Created in 2009 by Nathalie Haussmann via Haussmann Famille, a subsidiary of the Larraqué Vins International family group, the Haussmann brand is celebrating its 10th anniversary this year. With a strong dynamism in a market of Bordeaux wines in search of a new impetus, Haussmann Famille marketed 5.3 million bottles signed Haussmann in 2018. We met Nathalie Haussmann who tells us the story of her brand and evokes the reasons for this international success. Born in Paris, Nathalie bears the name of her famous great-grand-uncle, Baron Haussmann. Like her grandfather, who was fond of wine and fell in love with Octavie de Laharpe, daughter of a Bordeaux merchant, Nathalie Haussmann, Parisian, fell under the charm of Pierre Jean Larraqué, a wine merchant and chateau owner of Bordeaux. She left Paris to settle in Bordeaux, discovered the wine but never forgot her roots. Her wish: pay tribute to her name and to the man who made it famous during the Second Empire: Georges Eugène Haussmann. “During my childhood, I grew up surrounded by Baron Haussmann’s work. I have always admired him. I feel very proud to bear the name of the man who helped make Paris the most beautiful city in the world,” says Nathalie. And she concretized her wish to pay tribute to her grandfather in 2009, year of the bicentennial of the Baron’s birth. She launched her first brand of wine: Haussmann Baron Eugène. What she thought to be a simple tribute to her name quickly turned into a true success story. Successful challenge for Nathalie Haussmann. Her cuvée Haussmann Baron Eugène quickly seduced French consumers. Seven years after its launch, it has become one of the 10 most popular Bordeaux wine brands in France. With a prestigious and recognized identity, the Haussmann brand is also facing strong development internationally. In Africa (Côte d'Ivoire, Cameroon and Benin), the strong presence of Haussmann wines allows it to position itself as the leading brand of Bordeaux wines. Haussmann is also developing strongly in China, currently the brand's leading export market, but also in Belgium and Russia, where customer requirements are very different. Building on this success, Haussmann is developing in the south of France and is gradually investing in the emblematic places where the Baron used to live. In 2015 Nathalie created ‘By Haussmann’, a range of single varietal Pays d'Oc PGI wines. Relying on a structure well-established near the Mediterranean, Nathalie Haussmann produces five emblematic grape varieties: Merlot, Cabernet Sauvignon, Shiraz, Chardonnay and Sauvignon Blanc. In 2016, Nathalie Haussmann went to Provence, like her great-grand-uncle and launched ‘H de Haussmann’, a high-quality AOP Côtes de Provence rosé. 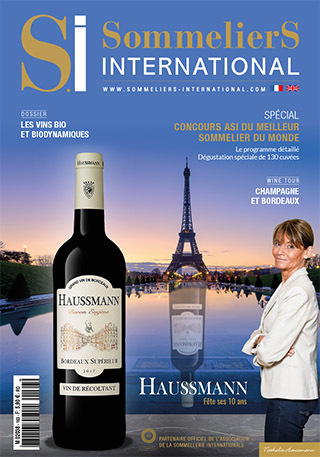 10 years after the creation of the Haussmann wines, Nathalie Haussmann wants more than ever to promote the French values across the world. Poet, she writes a poem on each of the cuvées that she crafts. A personal touch she leaves on her bottles with the hope that her words resonate in each of us and take us a little more in her universe. For the Baron's descendant, “Haussmann is to wine what Paris is in the world: a subtle combination of history and elegance”. A symbol of the French way of life that proudly claims its origin and affirms its Frenchness. Haussmann is perhaps just another way of saying Paris.